Open Innovation 2.0 2017 events series drew to a close on the 14th of June in Cluj-Napoca after five action-intense days. 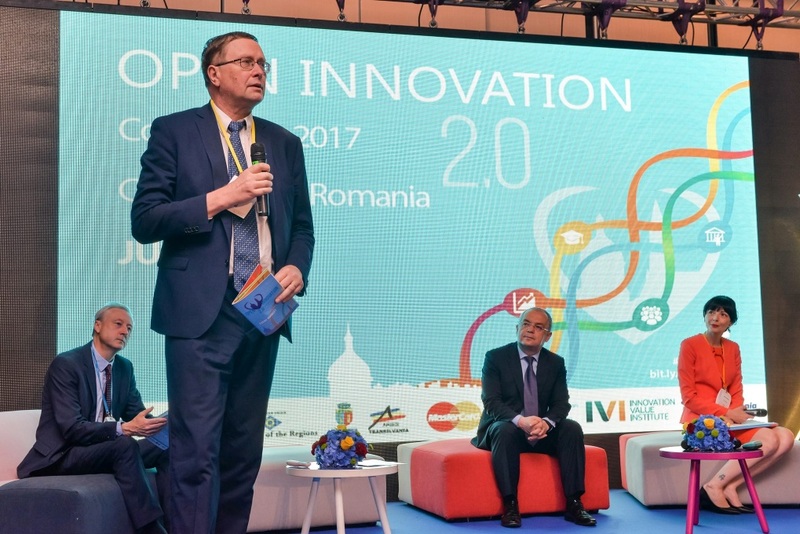 More than 500 guests from 20 countries attended the open innovation 2.0 workshops and seminars, conducted by 70 speakers under the lead theme of “digital innovation” – a new record in terms of participation and national diversity. This year’s global span on the cooperation for innovation across the entire Europe and reaching out to Japan had a major impact from the beginning. What set apart Open Innovation 2.0 Conference in Cluj-Napoca, was the fact that the organizers entangled a series of events starting with the city’s first Innovation Dialogue on June 10th and 11th, followed by the Clusters Matchmaking on June 12th (that had a dedicated session to Korean-Romanian cooperation), the first Town Hall Debate chaired by the Committee of Regions on June 13th, the 2-days OI2 Conference itself and the Innovation Luminary Awards, in the evening of June 13th. The European Cluster Collaboration Platform (ECCP) was present at the conference, where its Content & Communication Manager, Lucia Seel made a presentation about the journey clusters made from the triple helix to an ecosystem approach and what role the ECCP plays in the open cluster community. Lucia emphasized the fact that ECCP is “the network of networks”, embedding more than 600 cluster organisations from Europe and beyond and providing services for them that support international cluster collaboration. The ECCP approach is user-driven, it was designed with the support of users, a large part of the content is coming from the users themselves, and there is a quick reaction to adapt to the needs expressed by the users. In addition to facilitating the interaction between cluster organisations (both in real-life and virtually), ECCP also connects with other related platforms and brings in elements from these that are relevant for the international cluster community. The group supports policies for Open Innovation and works in close collaboration with the European Commission. (@DigitalAgendaEU). OISPG philosophy embraces the Open Innovation 2.0 paradigm: creation of open innovation ecosystems where the serendipity process is fully-fledged. OISPG members believe that involving citizens directly in the innovation process allows rapid prototyping in real life. Building a prototype is the fastest, most effective way to push an idea forward. Prototyping will foster entrepreneurship in Europe, will create jobs and will boost sustainable economic and societal growth. Therefore, OISPG suggests various open innovation actions and approaches to industry and to other innovation partners in order to stimulate and strengthen competitiveness.